We planted dwarf sorghum and several varieties of dwarf (4 to 6 feet tall) sunflowers in a ring around three 10 x 20 foot garden plots on April 14, 2015. The goal was to see if many BMSB fed on the trap crop and hopefully not on the tomatoes or other crops. At the same time, the plentiful BMSB population provided BMSB insects for colonies being maintained and expanded by CDFA and UC Davis. Collections were made from the planted trap crop, as well as from other sunflowers in the garden. Photos of the trap crop and BMSB are below. 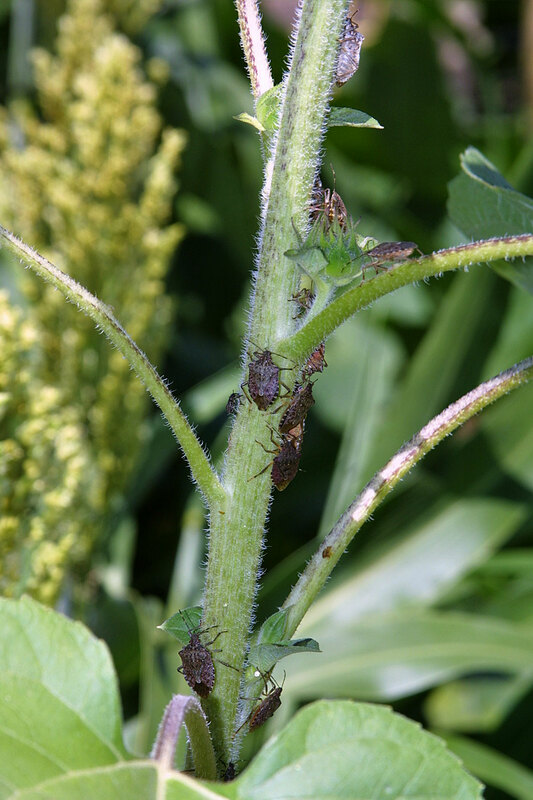 The sunflowers attracted nearly all the BMSB on the trap crop; very few were found on the sorghum, and only after flowering and the start of seed set did sorghum attract a few BMSB. 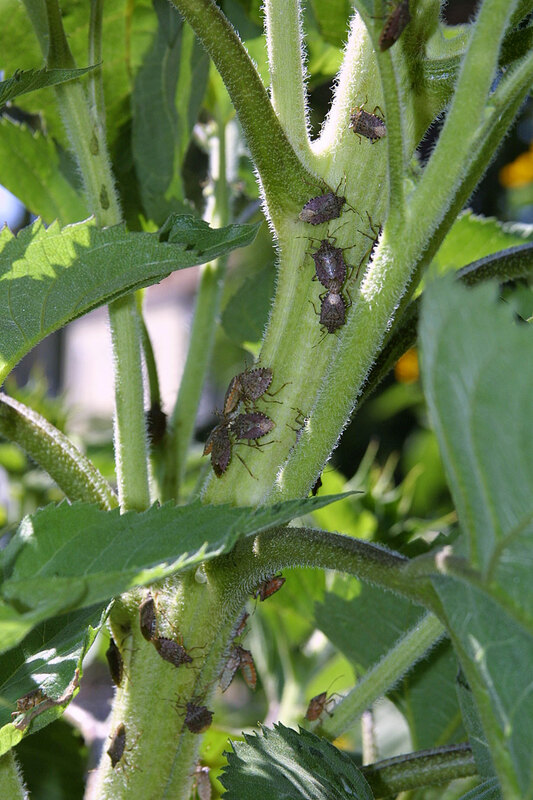 Some BMSB nymphs and a few adults were found on the sunflowers on the first three counting dates, and they were killed upon counting. Then by June 16, the adult BSMB population skyrocketed and remained high until sometime after the July 13 sampling date. BMSB were not killed upon counting from June 16 onward because attempts to capture them would result in large numbers that would escape. However, hundreds of BMSB (284 adults and 29 nymphs) were captured mostly from sunflowers in the trap crop and other sunflowers for rearing in colonies on June 23 and June 26, and another 170 adults and 57 nymphs were caught July 13 after counting. Therefore, a total of 540 BMSB have been removed from the garden, mostly from sunflowers. 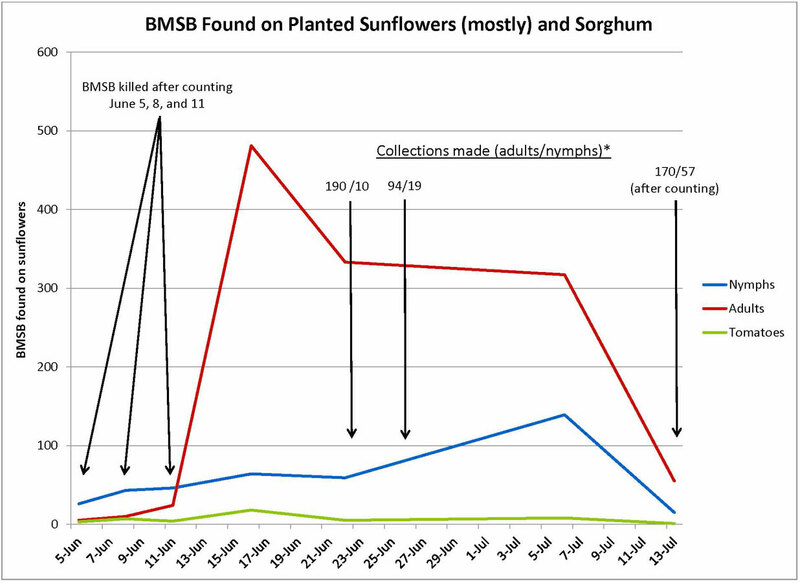 Very few BMSB were found on several tomato plants (see graph); however, BMSB are much harder to find on the caged tomatoes than on sunflowers. Some BMSB were also found on beans and corn, but not large numbers. 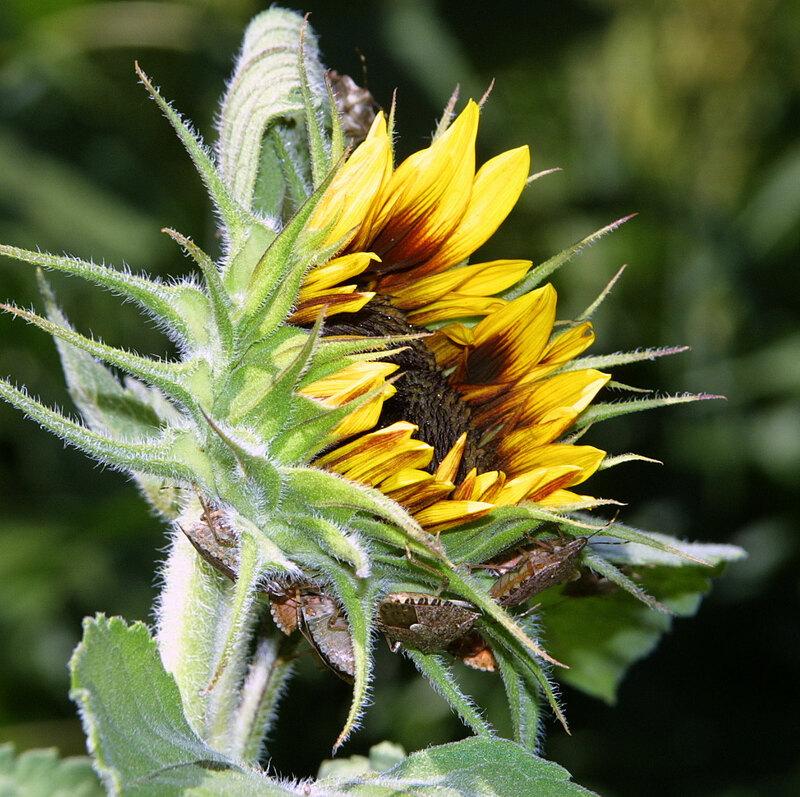 This study was not designed to determine if the use of a sunflower trap crop can reduce the number of BMSB on vegetable crops. It does show that sunflowers are a highly favored garden plant, but would they have instead fed on the vegetables? Did sunflowers simply draw the BMSB into the garden by their height, yellow flowers, and/or scent? These questions will have to be answered in a larger trap crop study. Nonetheless, BMSB are easy to see on sunflowers, so they are easy to vacuum or capture and kill--much easier than on dense tomato plants. One important point to note is that we found no BMSB on the very dwarfing sunflowers (1 to 2 foot height), and we found far more BMSB on the 9 to 10 foot tall adjacent sunflower than on the 4 to 5 foot tall planted sunflowers. 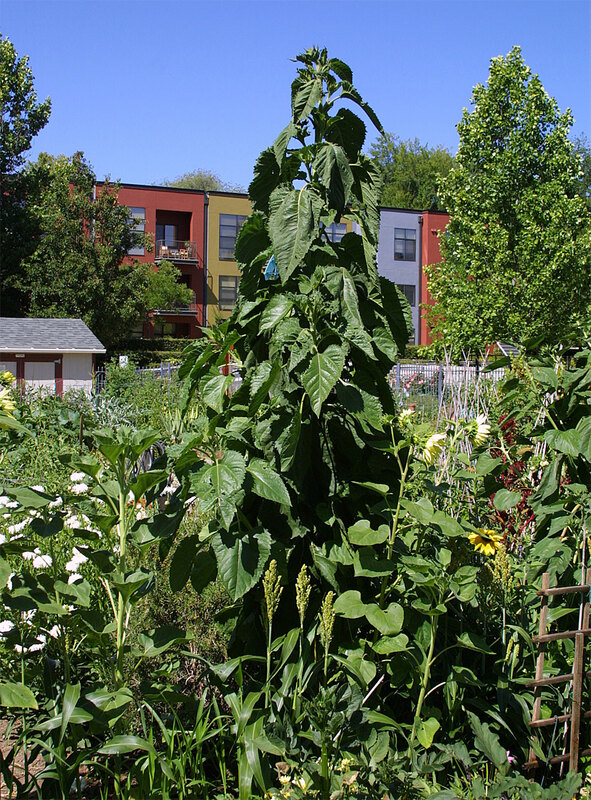 Clearly, the taller and more massive sunflowers, the better for attracting more BMSB. 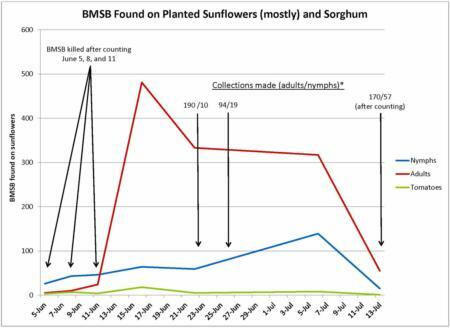 In the graph below, the data lines are the BMSB that were found on the planted sunflowers and a single, large, adjacent sunflower that started growing before the trap crop was planted. 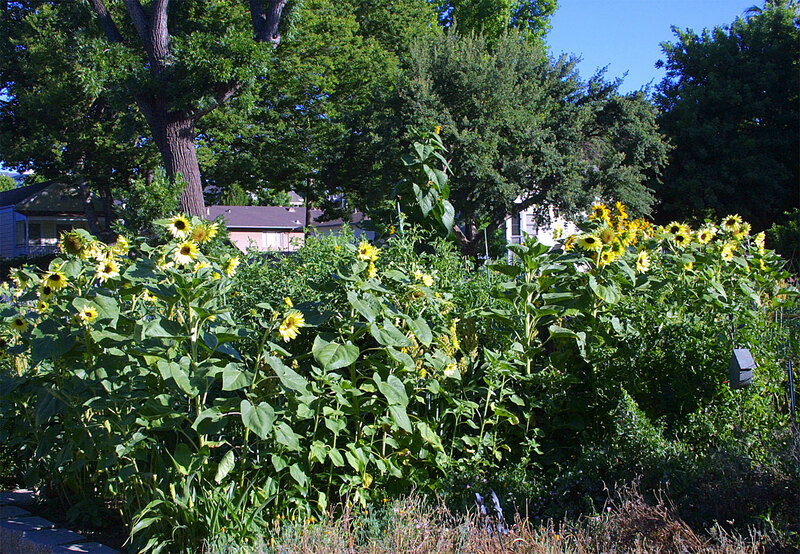 The large sunflower adjacent to the planted sunflowers (4 to 5 feet tall) attracted far more BMSB than smaller plants. 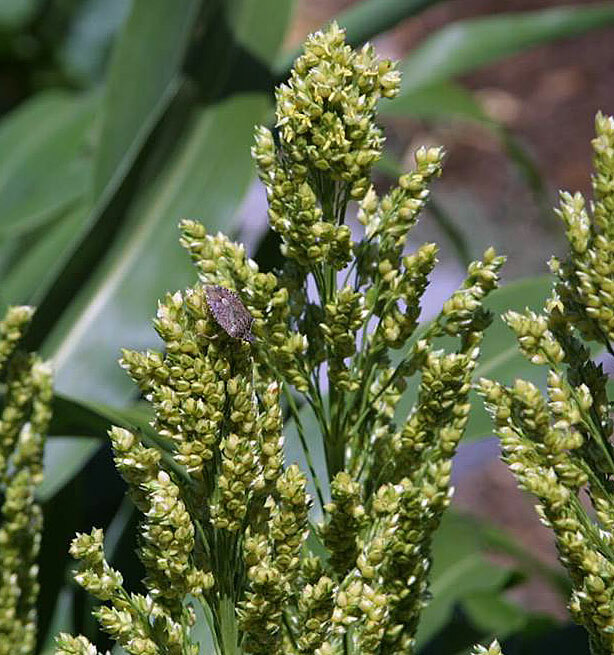 Adult BMSB on sorghum flowers. Very few BMSB were found on sorghum, even when seeds formed.